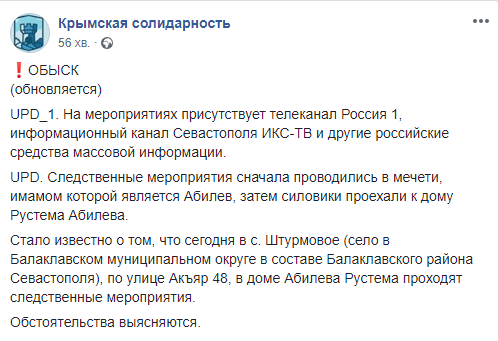 Today, April 15, in the illegally annexed Crimea, Russian security forces have searched a mosque and its imam (rector – Ed.) Rustem Abilev. According to the public association Crimean Solidarity, the law enforcement officers came together with journalists of the Russian propaganda channel “Russia-1”, the information channel of Sevastopol X-TV and other media. Later, the house of imam Abilev in the village of Sturmove near Sevastopol was searched as well. On January 18, 2019, on the eve of the Friday prayer, police and riot police arrived at the mosque in the village of Dubki, Simferopol District. Then, journalists from the Millet channel, controlled by local authorities, arrived at the scene together with the Russian security forces. A year ago, on April 6, 2018, after the Friday prayer, FSB officers raided the mosque in the village of Pavlovka, Dzhankoy district.